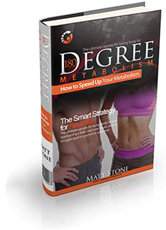 180 Degree Metabolism is a weight loss program created by Matt Stone, author and independent health researcher. His intention in writing this book is to inform dieters how hormonal factors play a major role in weight management and to explain how strict dieting and excessive exercise can actually make it harder for you to lose weight. Stone encourages you to follow a series of steps that first allow you to heal your metabolism so that you will then be able to lose weight easily. His program is not just about solving your weight problem but also about enabling you to get to the point where you can eat what you want while staying lean and healthy. In this phase you will prime your metabolism by eating as much food as you can and keeping exercise to a minimum. Your diet choices don’t have to be perfect but you are advised to limit your intake of sugars – including those found in fruit, juice and sweets. The consumption of complex carbohydrates such as rice, corn, beans and vegetables is encouraged. This is the fat loss phase of the 180° Metabolism diet program. During this step the primary focus is to eat three evenly spaced and evenly sized meals a day, containing somewhere between 20 and 40 grams of protein per meal. Each meal should also include a portion of starch that is at least half the size of your protein portion. This could be one potato, a scoop of brown rice, 2 slices of wholegrain bread or a bowl of oatmeal. The meal can also include healthy fats and it is best to keep the vegetable content of each meal quite high. The final step in body recomposition is related to learning how to eat and live your life when you have achieved your ideal weight. Stone recommends eating real food, sleeping well, avoiding drugs and to spend a lot of time involved in daily physical activities. Salmon, tuna, chicken breast, cottage cheese, lean meat, eggs, legumes, potatoes, oatmeal, quinoa, whole grain bread, berries, apples, pears, citrus fruits, milk, yogurt, coconut oil, butter, macadamias, olives, spinach, lettuce, broccoli, green beans, asparagus, herb tea. Stone says exercise is overrated and getting too much can be just as dangerous as getting too little when it comes to weight loss. 180° Metabolism encourages dieters to only exercise for pleasure and to emphasize activities they enjoy. Being active during the day in pursuits such as gardening and cooking, is better than jogging or lifting weights for an hour and then sitting in front of a television or computer for the rest of the day. It appears that this diet is no longer available. See instead The Metabolism Miracle, which is similar. May help to repair metabolism damaged due to chronic or extreme dieting. Can help dieters to get out of the yo-yo diet syndrome. Flexible plan that does not require avoidance of any food completely. Provides detailed information about hormones and how they are involved in weight loss. Encourages the intake of a variety of whole, unprocessed foods. Meal plans are too high in calories for smaller or less active women. Meal plans are very high in saturated fat. Will take time for results to become apparent. Some dieters will gain weight during the first phase. Maintenance guidelines are very vague. 180 Degree Metabolism helps dieters to understand the negative effects of low calorie diets and excessive exercise on long-term weight management, while presenting a basic plan to heal the metabolism that may be disrupted due to a history of chronic or extreme dieting.